Platinum Removals offers you a great deal for all your moving and removals services!We charge on an hourly rated system so that you only pay for the work that you need from our removalists! Add and remove additional services as you require so that you can manage the budget and the final removal price that appears on the bill! Do check with our consultants about what other services we can provide you and how to best plan out the removal services you receive. When it comes to moving and removals for your home, Platinum Removals understands how the move needs be to coordinated to pack and remove all the items, room by room, smoothly and efficiently, without taking any risks to avoid incidents and damage. Let our professional removalists take some of that weight off your shoulders both figuratively and literally! We’ll help you plan and carry out a flawless house removal so that you can take things easy! Sit back and relax, and let us do the heavy lifting! Platinum Removals wants you to experience just how comprehensive a moving and removals package can be now that we offer you self storage options for your home items! When you’re undertaking a move, there are lots of items that need to be kept safely out of the way while you are settling your family into your new home. We give you the opportunity to keep these items conveniently in a safe and secure storage unit all at the same time that you’re executing the big move! We’ll come to your premises and help you load up the storage unit and keep your precious belongings at our storage warehouse until you need them back again! All you need to do is let us know how many storage units you need and we’ll take care of the rest! If you’re looking for a solution to your office moving and removals, you’ll be pleased to know that we’ve also handled some of the biggest office removals in Sydney with over 20 removalists assigned to get things shifted and installed in new premises over a weekend! We can provide you with the same professional service from planning to executing a large scale move and minimize the down time for your business! Anything can happen on moving day. Even with the best laid plans, there are some situations that we can’t control, like bad weather, last minute changes from facilities management and even (heaven forbid) the lift breaking down! While we are doing our best to make sure nothing affects the items you have entrusted to us, you can take control of the situation by getting comprehensive content insurance to make sure that your items are safe and secure no matter what might occur. Platinum Removals is the most reliable choice for all types of Sydney furniture removals. Whether you’re in the CBD, Northern Districts, Woollahra or a number of other locations around the greater city limits, Platinum is the finest removalist in Sydney for taking care of all your packing and delivery needs from start to finish, 7 days a week. Our team brings terrific experience to every task, ensuring that your furniture and valuables are treated with the utmost care throughout the move. We can help with any type of home or office removals in Sydney, and we can even put your items safely in storage for you if need be. We recognise the importance of getting the job done quickly, efficiently and unobtrusively, so that we can facilitate your move with minimal disruption to your ordinary routine. For especially important tasks, or jobs requiring extra delicacy, we can provide packing and unpacking services, and we’re also able to individually bubble-wrap your items. We pride ourselves on being the most careful cheap removalist in Sydney, but insurance is nevertheless available for items being relocated just in case anything should happen. If you’d like to do the packing and unpacking yourself, Platinum Removals can still provide valuable services before moving day. We can deliver boxes to you at no extra cost within a 5km radius of our offices in Dover Heights, and we can also deliver elsewhere for a fee. We have several box sizes available for your use, as well as packing paper, tape and marking pens to help you keep everything organised and properly separated during a busy time. We’ll be happy to collect any used boxes afterwards and give you a partial refund for them – and also collect any unused boxes for a full refund. For office removal around Sydney, we’re able to make appointments outside of regular business hours, so that your staff doesn’t need to experience any inconvenience on moving day. We can assign teams ranging from two to twenty men to your business on relocation day, so that jobs of any size can be carried out with great speed and efficiency. We always follow and respectfully obey the requirements of your building and facility, from the parking lot to the office. Our devotion to providing the highest quality services has earned us glowing reviews from local businesses that came to us for their Sydney city removal needs. For home removalists in the Sydney Eastern Suburbs, Bondi, the Hills District or elsewhere around Sydney, we can talk you through the project and give you an accurate estimate for the relocation as soon as you reach out to us. Our consultants can help you determine which parts of the move you’d like us to manage, and which you prefer to do yourself – a valuable step for keeping your relocation under budget. Many movers like to do their own packing, but just be aware that furniture removal in Sydney is no easy task – and the packing should begin before moving day. Alternatively, leave it to our master packers and we’ll have the packing job done in no time, on the very morning that the full relocation takes place. Either way, you’ll find that the move itself takes place without any unnecessary troubles or delays (or hidden costs), as our Move Coordinator will ensure your satisfaction at all times. Our state-of-the-art moving trucks are equipped with padding, blankets, trolleys, straps and special moving technology to protect and transport cargo of all sizes and shapes. We maintain professional standards even as we move heavy furniture through bad weather, narrow stairs, broken elevators and a lot more, so save your anxiety and give all the hard work to us. Our teams of furniture removalists in Sydney are prepared to deal with anything – including the job of unpacking everything after the move has been completed. If your new location isn’t quite ready to receive all your furniture, or there are other items which need to be put in storage, fear not – we’ve got you covered. Sydney’s premier furniture removalists are also willing and able to lock your belongings safely away in temporary storage for as long as you need. Our own storage warehouse is ideally suited to provide a secure home for your belongings. These storage units are enough to hold a bedroom full of items – including bulky or unwieldy ones, such as bed frames, mattresses and dressers weighing up to nearly a ton per unit. The units are made of wood to better protect the interiors from mould and mildew. At our warehouse, we also cover each unit, put it onto a pallet and lift it off the ground to provide an extra measure of protection from its surroundings. The best feature of our storage option? It’s mobile. That’s right – we drive it right up to your door and help you load your furniture or other valuables inside. From there, we drive the mobile storage unit back to our warehouse for safe-keeping until you’re ready to pick it all up. The result is maximum convenience for you every step of the way. With all of these features and our unfailingly friendly service, it’s no wonder we at Platinum are Sydney’s most complete and professional removal team for homes and offices. Browse our website for special package deals and promotions, and contact us anytime to learn how we can help you – or even just to speak with us about the prospect of relocating in the greater Sydney area, with no further obligation. From start to finish, it’s our job to make your move go as easy and as hassle-free as possible. Beginning with that initial phone call and quotation, and ending with a smile and a firm shake of the hand with your furniture and other possessions safe and unpacked at your new location, Platinum Removals has the resources, know-how and work ethic needed to turn the most logistically challenging tasks into a breeze. Come talk to us, and let us show you what we can do. Platinum Removals now operates within and around Melbourne as well, from its new office at 167-169 Cremorne St. Our Melbourne team offers the entire range of services that has made Platinum the most trusted name in relocation. 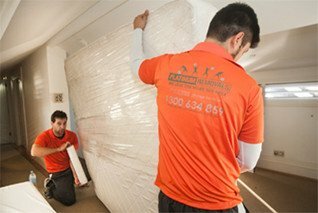 For removals and storage in Melbourne, our professional team offer the best service on the market, covering homes and office alike. Moreover, our expansion means that we can now offer the services of interstate removals between Sydney and Melbourne, helping our customers make long-haul moves between those two cities. As always, we are available to help with packing, careful relocation of all types of furniture and valuables, as well as unpacking at the new location. We even offer full storage solutions for maximum convenience, keeping your possessions safe and accessible for as long as necessary. Moving between locations is a complicated task, even before worrying about how many boxes you need or how to carry those big sofas, mattresses and desks down the stairs. Utilities must be set up, paperwork must be signed, mail must be redirected, friends and relatives must be contacted, along with dozens of other last-minute requirements. We might not be able to manage everything, but we at Platinum Removals in Melbourne and Sydney can take complete care of the most labour-intensive part of your move, leaving you free to begin life at your new location with a spring in your step and a smile on your face.